E-Motion welcomes new members to the team: David and Kevin Kin, Martin Tribo and Vesa Pykala. E-Motion to sponsor and participate in 2016 Grant-A-Starr Fun Run on April 2nd, 2016. Members of E-Motion are encouraged to participate in this great cause. To sign up please contact emotionrobots@gmail.com. 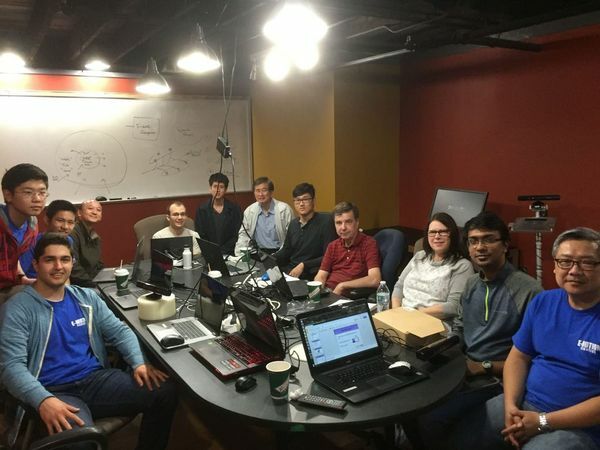 E-Motion hosted the first Intelligent Social Robots open meeting at Houston Robotics Club at TxRx Labs on Saturday, February 13, 2016 at 10:00 am. We discussed progress to-date and how participants can get involved. It was great meeting other people interested in the exciting new field of intelligent social robotics. E-Motion developed hand-tracking capability that will work with any depth cameras. This will enable touch-free communication with computers and robots. TED talk on Emotion Recognition. The future of robotics and computing will have emotion intelligence and be socialable.